IPL 2019: Virat Kohli and Sunil Chhetri are legends in their sport. 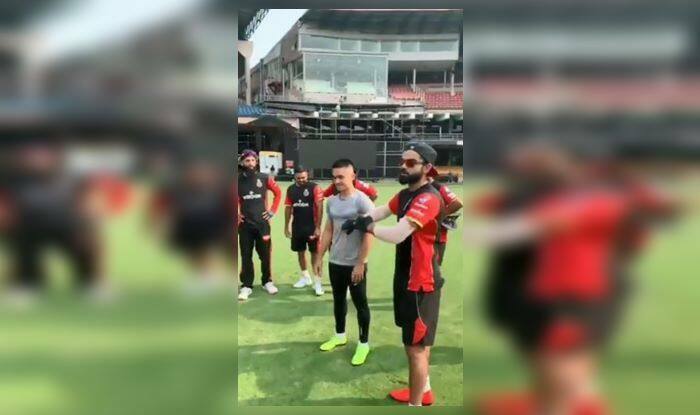 IPL 2019: India cricket captain Virat Kohli introduced his football counterpart Sunil Chhetri to the Royal Challengers team. Chhetri joined the RCB camp at the MA Chinnaswamy Stadium on Tuesday. Kohli courteously too the opportunity to introduce him to the foreign players in the RCB side. Sunil Chhetri recently led the Bengaluru FC to their maiden Indian Super League title by beating FC Goa 1-0. Chhetri was pivotal to the success of the side as he scored goals and made a lot of assists as well. The triumphant captain of the football side seemed to be enjoying his time in the RCB camp. Kohli was at the nets batting yesterday and he looked in good touch which augurs well for RCB. Meanwhile, RCB would be playing the tournament opener when they host defending champions Chennai Super Kings. RCB happens to be one of the few sides who are yet to win the title. Over the years the side has comprised of some of the biggest names in the game, but have not come well together even once. Kohli would like to change that in 2019.